Frontier® Cartridge is a division of Hornady® that uses state-of-the-industry loading techniques and quality control procedures to ensure the reliability and consistency of every round. Made in the USA with military-grade brass cartridge cases, primers and propellants. 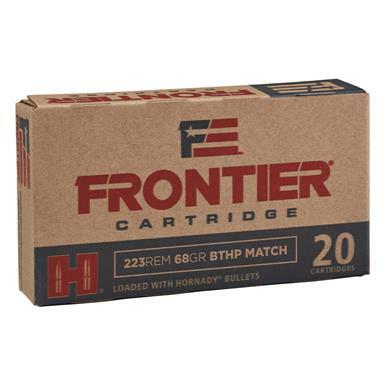 Hornady, Frontier Cartridge, .223 Remington, BTHP, 68 Grain, 20 Rounds is rated 4.0 out of 5 by 2. Rated 5 out of 5 by mark from great groups around 1 moa at 100 through a stag varmint 24' barrel with 1/9 twist will buy more!200 yards had great potential but my cross hairs were a little too fat.